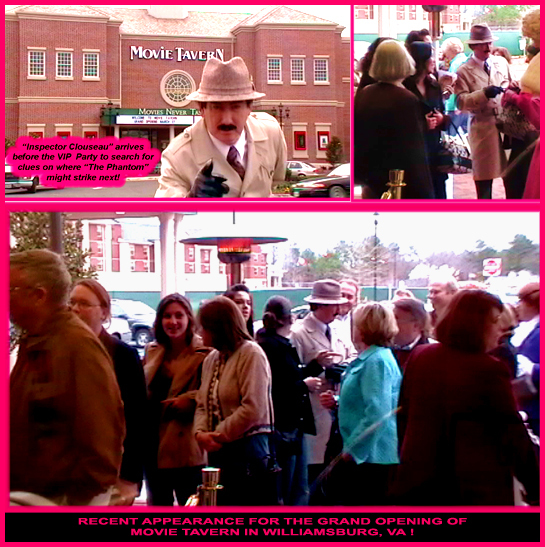 This Inspector Clouseau impersonator look alike, in his trench coat, tweed alpine hat and dashing moustache is instantly recognized by fans of the hilarious 1960’s Pink Panther movie series. Anyone who was a teen or young adult of the 60’s knows the looks, manners and comical hi-jinks of Inspector Clouseau, the central character portrayed by popular British actor, the late Peter Sellers. Tim Beasley, a professional actor himself, specializing in celebrity impersonations, brings Inspector Clouseau back to life in all detail- looks, voice and animated antics. Having a special event, or as the French say, soiree? Tim as “Inspector Clouseau” is perfect for any Hollywood, Mystery, 1960’s or even French theme events…. and from years of on-stage experience being a promotional entertainer, he’s also a master emcee! Here’s a great party idea and central theme perfect for glamorous special events, fund raiser galas and socials…have a “Pink Panther Party,” ala Monte Carlo ball! Guests come dressed out in full (or over the top!) fashion….”Inspector Clouseau” will provide clues as to where the “Pink Panther” diamond is hidden, leading up to prizes awarded and possibly a “fun arrest” at the conclusion. Guests, especially the ladies in their finery, also enjoy getting their paparazzi photos with the lovable bumbling detective! Don’t take “A Shot in the Dark” and have an ordinary party…book this unique professional who’s a black belt in ”“killing the audience” with class. Anything less would be a….crime!